System T offers exceptional power and flexibility with 3072 input and 3072 output connections. The T80 Engine provdes 800 active audio paths and the T25 Engine provides 256. Paths are pooled and consumed dynamically according to user configuration. Any console configurations within pool limits are possible. Channel or bus paths can be added or reconfigured at any time without rebooting and without interruption to audio. A pool of up to 192 mono mix busses with the T80 Engine or 128 with the T25 Engine can be used as desired within defined maximums for each bus type (providing up to 16 Master Buses, 32 Stems, 32 Auxes, 48 Mix Minus Buses and 64 Track Buses). Paths and buses can be freely configured in a range of formats up to 5.1. Path configuration is via an intutive drag and drop interface. 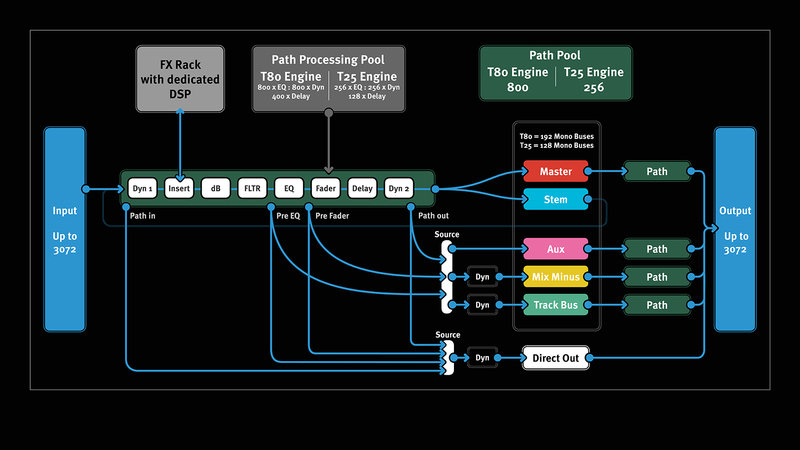 Dedicated path processing provides EQ’s (T80 x 800, T25 x 256), Dynamics (T80 x 800, T25 x 256) and Delays (T80 x 400, T25 x 128). The primary signal path has eight process blocks that can be configured in any order using a drag and drop interface. These are preceded by the Path gain trim (and Input selection/conditioning on Channels). The primary path output feeds either the panning and bus routing (channels and stems) or is available as a source in the main console signal routing (buses). Two dynamics sections can be activated in each path to facilitate cascaded Compressor/Limiter configurations, or adding dynamics to the channel direct output, mix minus or track bus send. An insert send accesses additional signal processing in the System T FX Rack or external hardware via the console routing. The System T FX Rack includes a comprehensive set of SSL’s acclaimed studio quality signal processors with their own dedicated DSP pool. 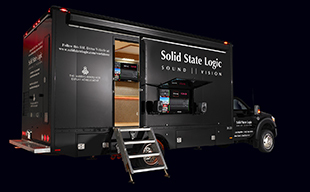 The selection includes loudness metering, additional tone and dynamic shaping, reverbs, room simulation, ambience processing, dialogue noise reduction, signal generation and analysis tools. Effects are accessible via the Path inserts, or via the console routing using the Aux and Track buses for parallel time based effects. All settings are saved in the System T Showfiles and snapshot automation.